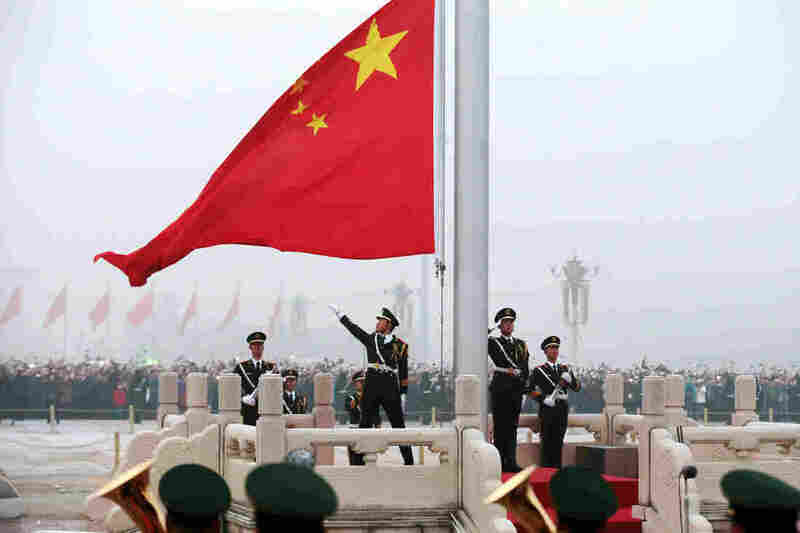 China Unbound: What An Emboldened China Means For The World China has definitely risen. NPR's correspondents set out to find out what that entails, reporting from more than a dozen countries across the globe. Honor guards attend a flag-raising ceremony at Tiananmen Square in 2017. Under President Xi Jinping, China has ambitiously pressed its advantage almost everywhere at once. Of course, that never happened, and China has spent much of the past 150 years regaining its place on the world stage. Its march to economic behemoth is well-known, a string of impressive breakthroughs, superlatives and the unprecedented creation of wealth that came along the way. China's financial fortunes — especially in the past three decades — have led to greater political influence and diplomatic sway in almost every facet of international life. Democracies crave its markets and investment. Fellow authoritarians heap praise on its stability and unchallenged rule. International institutions bend the rules to accommodate Beijing — or China simply launches its own global schemes and initiatives. Don't see the graphic? Click here: China's Expanding Global Reach. Under President Xi Jinping, China has ambitiously pressed its advantage almost everywhere at once. It tightens its strategic grip on the waterways of the South China Sea, while it deepens its trade and business ties in the Americas, just south of its chief rival, the United States. Its Belt and Road Initiative — what amounts to a nearly global infrastructure bid — pours billions into paving, dredging and remaking large swaths of Africa, South Asia, Europe and elsewhere. In its breadth and sweep, some see an economic lifeline to struggling industries and developing economies — or a ploy to trap them in decades of debt and dependency. What is clear is that, like at no other moment before, the world is coming face to face with a more assertive, strengthened and invigorated China. For nearly 30 years, the media have been reporting on a rising China. It's time to say it has risen. But what does an emboldened China mean for the world? We have set out to answer that question with stories reported from more than a dozen countries across the globe. We chased it from the train stations of Kenya to the factory floors of Germany, from the deep-water ports of Belgium to the soccer pitches of Brazil. It's a story that reaches from England's oldest universities to the shiny new startups of Silicon Valley. More than 150 years ago, it was the West that forced China to comply with one unequal, compromising treaty or agreement after the next. ... Is China now returning the favor? China seeks to bend the world to its liking — on its face, that shouldn't be unexpected. That is what others like Great Britain and the United States did before it. But fears mount when that rising power is an authoritarian regime that views democratic values and pluralistic societies as an existential threat. What does it mean when China, no longer content to control free speech at home, seeks to stifle the public sphere in democracies overseas? China has long considered criticism of its human rights record or foreign policy as an invasion of its sovereignty, as illegitimate interference in its internal affairs. What changes when it is Beijing that throws its weight around and interferes in the politics of places from Cambodia to Greece, from Australia to Morocco? More than 150 years ago, it was the West that forced China to comply with one unequal, compromising treaty or agreement after the next. In places starved of capital and struggling to stay afloat, is China now returning the favor? Whatever the answer, China is increasingly dictating the terms. Nothing is predetermined, beyond this: We are just beginning to learn what an emboldened China means for the world, and it will leave its mark.